In a politically correct world, race relations have been, and likely will remain, a hot button topic. With a society walking on eggshells, treading lightly on how we deal with race is immediately scrutinized. Such is the case in Cheryl L. Davis’ Carefully Taught. Morality and personal relationships are put to the test in Astoria Performing Arts Center’s latest offering. Carefully Taught is a very delicate story that deals with reverse discrimination after Claire, a white social studies teacher, is fired over Alice, a black social studies teacher with an excuse of budget cuts. When the news blows up, Claire and Alice are pitted against one another as their daughters face their own backlash. Written by Cheryl L. Davis, Carefully Taught is truly fascinating. The themes and topics Davis brings up are important and thought provoking. Reverse discrimination can be even harder to talk about than discrimination on its own and Davis should be commended for it. Though the way Davis structures the story is a bit problematic. Davis tries mightily hard to play with duality. And it’s certainly a stimulating idea. But the split scenes that Davis offers are a bit difficult to play on stage. There’s a natural theatricality in Davis’ script but these scenes hurt the genuine moments the story calls for. It’s expected that when a character calls off stage, the audience believes there is a person on the other side of the conversation but the way Davis offers it, especially in the very first scene, felt forced. Altering the answer-based dialogue to play effortlessly would be of great aid. The other moment of the split screen nature that lost its impact was the classroom scene where we watch Alice and Claire teach. While it may be due to the staging by Pat Golden, the moments of silence destroyed the momentum of the lesson. Streamlining the pauses would allow the scene to really be of importance. The other bit of duality that Davis offers is having the actresses playing Alice and Claire play the others daughter. Davis, Golden, ASCAP, and the acting company should be applauded for how well the transracial script is handled. That being said, structurally, the kids detract from the flow of the story. The prime characters of Carefully Taught are Alice and Claire. While their daughters Charlotte and Valerie are integral devices for the story, their presence may not be entirely necessary. Most of their moments could have easily been discussed rather than pull away from the key characters. While this would certainly provide a different narrative, it would aid in the overall storytelling of Carefully Taught. What is striking about Carefully Taught is how strong of a relationship play it is. Davis creates dynamic bonds between the characters. 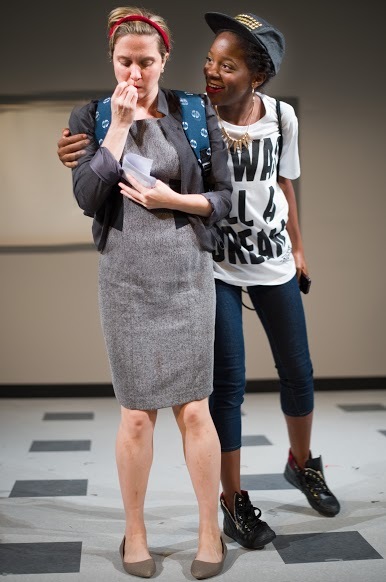 Latoya Edwards and Sheila Joon, as Alice and Claire respectively, are a fine duo, working off of one another well, but Joon’s strength as Alice far exceeded Edwards. Joon’s fight and passion makes her a worthy warrior but when she has her awakening late in the play, Joon’s vulnerability is touching. Edwards gave a very reserved and internal performance as Alice. Edwards’ Alice is ticking truth bomb. Bristol Pomeroy playing principal, senator, and reverend easily transformed from character to character. Esther Chen seemed to have the most fun as the local television anchor but Chen shined brightest during her monologue. Her command highlighted Davis’ strongest writing in the entire script. Pat Golden blended theatricality with realism to tell the story of Carefully Taught. Despite the struggles the script provided, Golden’s staging was smart. Though the multi-location story presented a number of woes with momentum-sucking transitions. The greyscale set by Christopher and Justin Swader allowed for simplicity in the boxed in space. The mirror image conceit worked for the play despite all of the little moving parts. Lighting designer Joyce Liao utilized harsh lighting for the majority of the play but played around with color during the interview scenes. The contrast worked well though it was likely your eyes were drawn to the live feed television screens. Costume designer Jessa-Raye Court had a difficult task of fluidly when it came to transforming the actors from character to character. Court and Golden occasionally worked the costume changes into Joon and Edwards journey but when they changed off stage, you could tell the transitions were covering for them. Carefully Taught is anything but careful. It’s daring. And should be praised. But Cheryl L. Davis’ storytelling could use some more workshopping.